Happy Thanksgiving everyone! Here is to hoping everyone out there is enjoying a nice day with family, friends or whoever you typically spend this day with. The weather, at least in NJ, has cooperated lets just hope my Cowboys do the same and put a smack down on the Dolphins, who all of a sudden look unstoppable. Into my Cowboys pint glass went this clear amber liquid and sitting atop that was a nice sized off-white head. Can you say ginger? That familiar aroma was quite evident in the nose so much so it even conveyed the spiciness of that awesome root. Me personally, I love ginger so this smelled really good to me. There were other spices at work here also…coriander and black pepper came to mind for sure. I picked up on that familiar Belgian yeast thing too along with bread. There was quite a lot going on here in the nose. I took a sip…wow…nice and spicy just like the nose suggested. The ginger was mixed with what I thought was a bit of a white grape like flavor. It had a very light cinnamony finish and aftertaste to it. This moderately bitter brew had a medium body leaning a bit towards heavy. It was quite slick feeling in the mouth. This was another delicious beer. Your mileage may vary since I know ginger isn’t everyone’s thing. I loved the spiciness and bitterness that the ginger lent to this. Again…Happy Thanksgiving to everyone!!! Oh yeah…lets go Cowboys!!! Watching my Cowboys on TV again thanks to the Giants being on tonight and the Jets playing this past Thursday. I can’t think of a better time to break open beer #357, Winter Rental Black Lager by East Coast Brewing from New Jersey, then now. This is East Coast Brewing Company’s 2nd beer they have brewed since founding the company in 2007. 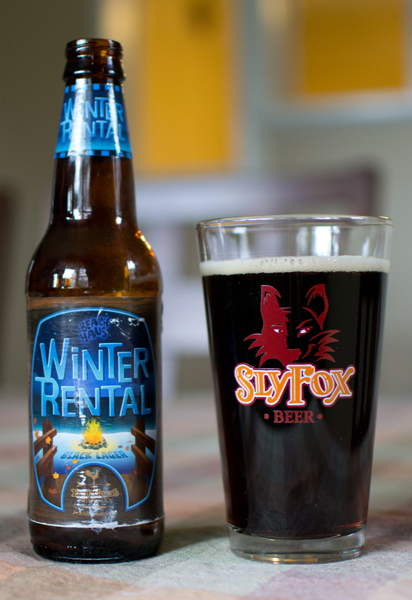 Brewed in the style of a Euro Dark Lager, this beer has an ABV of 5.6%. It poured a very nice dark ruby red color with an off-white head. This had a nice light roasted malt aroma with some caramel and coffee. The taste started off with a bit of a hoppy slightly bitter pine like flavor and then it got into the malts with roasted coffee-esque flavors and a bit of caramel. This had a body just south of medium and north of light. It had moderate amounts of carbonation and was fairly smooth. This was a nice solid beer from East Coast Brewing Company. I hope they do well and start brewing more styles…like a nice American IPA. I am feeling better today and the Dallas Cowboys are winning and winning big…good day indeed. Appearance – Amber color with hints of red when held up to the light. The head was tiny and white. Nose – OK…I know I’m coming off of being sick but I couldn’t smell much of anything other than the faintest aroma of malts..caramel possibly? Taste – Again…pretty much nothing. There was maybe a bit of a bitter pine flavor but other than that there was nothing distinguishable here. Mouthfeel – A bit north of light in the body with a low amount of carbonation. Overall – Horrible…there was nothing here that would make me recommend this to anyone. Skip this. I am watching the Dallas Cowboys are playing the New England Patriots (and it is on TV in NJ) as I type this…so if the blog remains unfinished, it just may be because the laptop goes flying across the room due to Tony Romo and how he plays. 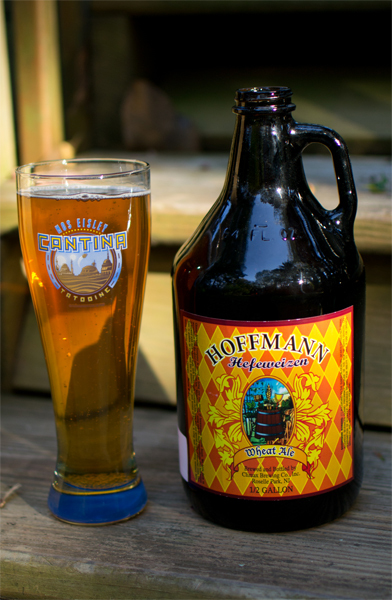 Beer #322 is Hoffmann Heffeweizen by Climax Brewing Company, my favorite brewer from New Jersey. Brewed in Roselle Park and in a growler no less, this Hefeweizen has an ABV of any where between 4.8% and 5.2%. Appearance – Clear golden color with a no head anywhere to be seen. Nose – Banana, Bazooka gum, wheat, yeasty bready smell…typical Hefe aroma. Taste – I get lemon here that I didn’t get in the nose. Wheat is also a big part of the flavor. The Bazooka gum flavor is evident in the aftertaste. Mouthfeel – The body is right smack dab in the middle of medium and light. Low carbonation makes this quite smooth and refreshing. Overall – A nice take on a Hefeweizen although I would like a bit more clove spice flavor. This would be nice on a hot summer day…or after a nice mountain bike re. Football night tonight…old cracked ribs and punctured lung Romo will hopefully be leading the Cowboys to victory against the Redskins. Go Boys! 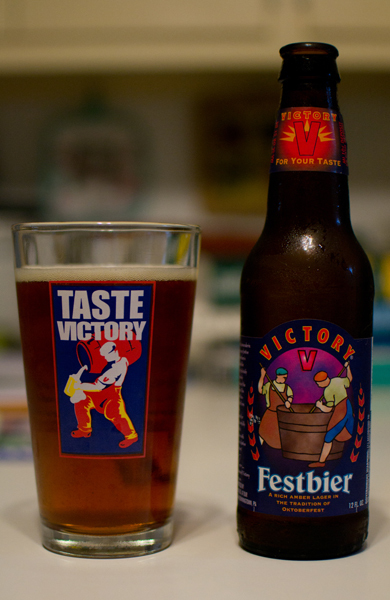 Beer #302 is Festbier by Victory Brewing Company from Downingtown, Pennsylvania. This Marzen or Oktoberfest has an ABV of 5.6%. It had quite the nice brownish amber color with just a very small tan head. The aroma was kind of light with some hints of roasted malts and caramel. Throw in a little bread and a nuttiness and you have the nose. It tasted liked it smelled with roasted malty flavor, a caramel flavor that wasn’t all that sweet, and bread. Near the finish, I got…bear with me…a flavor that reminded me of pretzels. That was quite interesting. It had a medium body, a nice amount of carbonation, was a bit crisp and at the same time…smooth. This was a very solid Oktoberfest that is worthy of drinking this time of the year. Prost! As a Cowboy fan, I wanted to choke Tony Romo last night but I figured why bother, he will choke on his own…which he did. Oh well…on to beer #288. 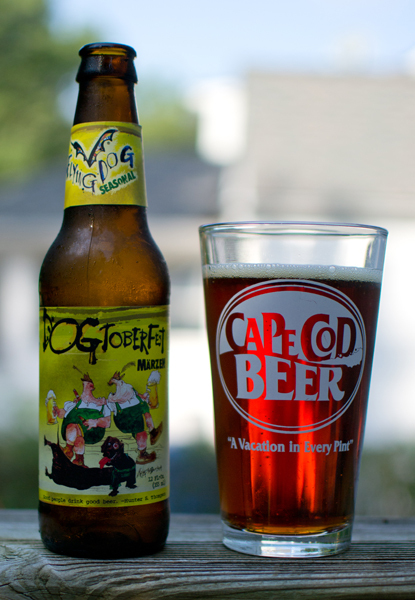 Dogtoberfest Marzen by Flying Dog Brewery is my brew of the day. 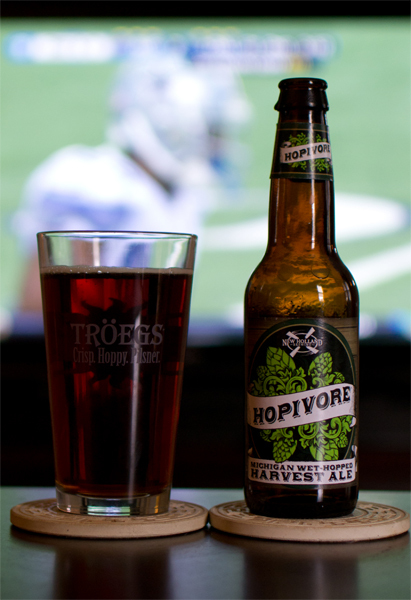 Brewed in the style of an Oktoberfest or a Marzen in Frederick, Maryland, this brew has an ABV of 5.6%. This is just about the right time for this type of beer as Oktoberfest (a famous German festival) is just about ready to begin. Get out those drinking mugs and lederhosen. Dogtoberfest poured a nice amber color with a touch of red to it. It had a thin white head. The nose was caramel malts and an aroma of something similar to those old butterscotch hard candies I still like to this day. It tasted mostly of caramel and had a bit of an apple taste towards the middle and back end. It had a nice slight bitterness towards the end also. The body was somewhere between medium and light and it had a moderate amount of stinging carbonation. This was a nice brew that was quite easy to drink. It was a solid beer that would make any Oktoberfest celebration quite enjoyable. This is a tough day for me. With what happened 10 years ago on 9/11, this is also the day I lost my father. 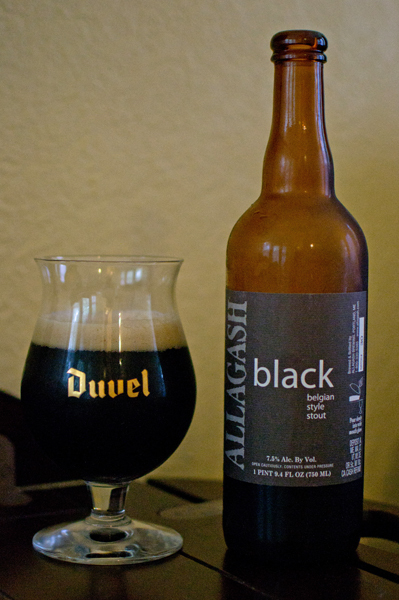 So with a heavy heart I will have beer #287, Allagash Black by Allagash Brewing Company. Brewed in the great state of Maine which is the same state my dad was born. This is brewed in the style of a Belgian Strong Dark Ale with an ABV of 7.5%. Into my tulip glass went this black brew with a tan head. The nose was coffee, dark roasted malts, and a very faint cocoa aroma. It tasted just like it smelled with the those nice coffee and cocoa (showed up more in the taste than the nose) flavors being the star here. There is also a smoky and burnt flavor that goes well with the coffee and cocoa flavors. With all of that going on, there was also a slight sweetness of dark fruit like plums or raisins that I was also able to pick up on. It all ends with a mouth pleasing bitterness. The body isn’t as heavy as it appears…think of it as a medium bodied brew. There is quite a bit of carbonation going here, very prickly on the tongue. The alcohol is hidden very well also. One thing to remember about this is to let it warm up a bit. The flavors open even more so as it gets warmer. This was an excellent beer. Yummy in every respect. Try it, I don’t think you will be disappointed. 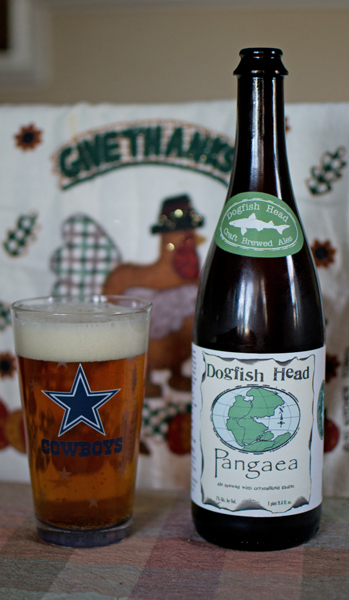 Here’s to you dad…I know you will be watching the Cowboys later on tonight hopefully beat up on the Jets.